The Port of Charleston cruise ship terminal is located in the peninsular city at 196 Concord Street at the foot of Market Street. It is in the heart of the historic district, offering the possibility of combining a visit to one of America's oldest cities with a fun-filled cruise. On the day of your cruise, the Union Pier Terminal Main Gate will be your entry point. The address of Union Pier is 32 Washington Street. The airport is only 20 minutes from the terminal. The meter fare for taxi departure from the Airport is around $35. CARTA’s bus No. 11, a public bus which serves the Airport in only $3. Take advantage of the new pre-paid parking process. Parking costs $17 per day. The design and building of a new cruise terminal at the Port of Charleston has been delayed several times. Charleston's new cruise terminal will be located further north on the SCSPA's Union Pier property within an existing structure. It will replace the current cruise terminal that opened in 1973. Just about everything you want to see is within walking distance. 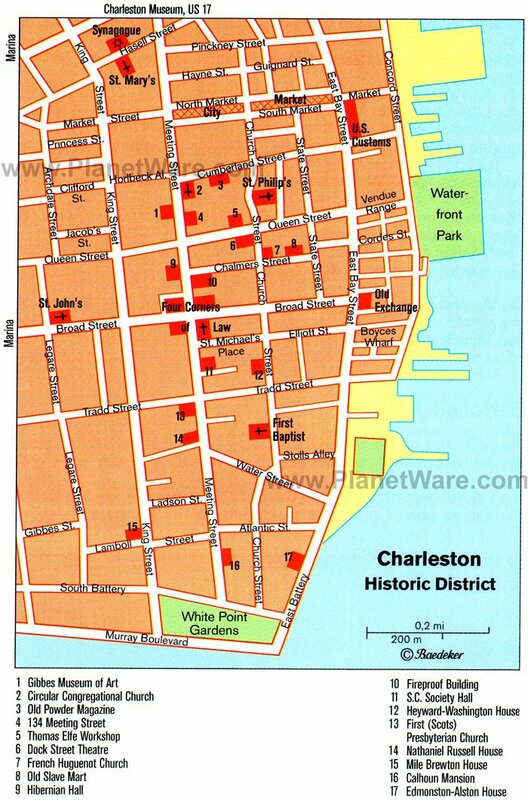 Charleston is a city in the state of South Carolina in the United States of America. It is located, rather like Manhattan, on a peninsula formed by two rivers flowing into the Atlantic, and protected from the open ocean by surrounding islands. It was captured early in the Civil War without much property damage, so the older part of town has buildings that are hundreds of years old. The skyline has practically no tall buildings and is dominated by the stunning Arthur Ravenel cable stay bridge. The city is a major port on the eastern seaboard of the US. When in Charleston, consider taking a carriage tour of the city. Several groups operate horse-drawn carriage tours of the historical sites in the city. Most of these tours leave from stands on Market street, next to the Market itself. While reservations are not required for these tours, they are run on a first-come-first-served basis, so plan to wait during peak tourist season. Luckily, most of the tour services assign a departure time, rather than making customers wait in line, so tourists waiting for a carriage can take the opportunity to visit the Market shops. Discount coupons are available in free tourist maps and guides. Charleston Museum. Founded in 1773 and commonly regarded as “America’s First Museum,” Focusing on the South Carolina Lowcountry, modern collecting emphases include natural history, historical material culture and both documentary and photographic resources. Fort Sumter. Where the American Civil War Began. Decades of growing strife between North and South erupted in civil war on April 12, 1861, when Confederate artillery opened fire on this Federal fort in Charleston Harbor. Fort Sumter surrendered 34 hours later. Union forces would try for nearly four years to take it back. Fort Sumter is located on an island in Charleston Harbor and is only accessible by boat. Joseph Manigault House. The Joseph Manigault House is a historic house museum at 350 Meeting Street in Charleston, South Carolina that is owned and operated by the Charleston Museum. Built in 1803, it was designed by Gabriel Manigault to be the home of his brother, and is nationally significant as a well-executed and preserved example of Adam style architecture. It was declared a National Historic Landmark in 1973. Equally fun walking tours include guided history tours and scary ghost tours through the streets of Charleston. Charleston is a city that is best explored on foot. A good place to start a tour of Charleston is the Visitor Reception and Transportation Center, located at 375 Meeting Street, not far from the entrance of I-26 into the city. Here, a visitor can receive maps and guides, book tours, and tour a small museum dedicated to the history of Charleston. The Market and the shops lining Market street are a popular shopping destination for tourists. The Market itself is a large gathering of small vendors that sell everything from blankets to candy. More traditional shops line Market street and most of these sell merchandise that is aimed at tourists. Upscale shopping in downtown Charleston can be found at the shops lining King Street. These shops are known for selling high-quality merchandise.